NASHVILLE, Tenn. (June 7, 2016) – If you’ve ever dreamed of sailing the seas with legendary country music stars, now is your chance. 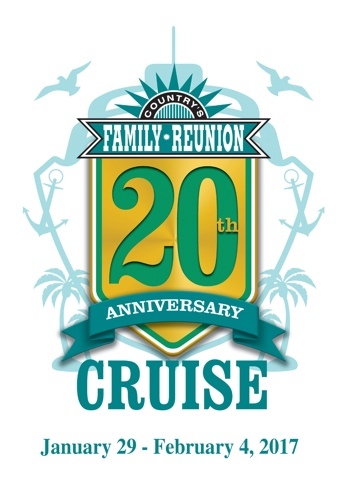 Join hit RFD-TV television series Larry’s Country Diner and Country’s Family Reunion as they set their clocks to island time from January 29 to February 4, 2017 and embark on the 2017 Country’s Family Reunion 20th Anniversary Cruise. The six-night tropical escape will set sail from Fort Lauderdale, Fla. and journey throughout the Western Caribbean about Royal Caribbean’s Freedom of the Seas cruise liner. Sightseeing and shopping stops includeGrand Cayman Islands,Cozumel, and Puerto Costa Maya, Mexico, all in-between LIVE performances from some of country fans’ favorite stars, comedy shows and more. Alongside meeting the beloved cast of Larry’s Country Diner, (spunky, dessert-loving church lady Nadine, Renae The Waitress, host Larry Black, Sheriff Jimmy Capps and announcer Keith Bilbrey), a cruise-goer package also includes 3 Country’s Family Reunion shows, an exclusive chance to meet the performing music stars in autograph and photo signings, a comedy show from Nadine, and an up-close-and-personal look at the Larry’s Country Diner show. Celebrities slated for the cruise include Bill Anderson, Jeannie Seely,Rhonda Vincent, Daryle Singletary, Gene Watson,Teea Goans, Mark Wills,Leroy Van Dyke, Johnny Counterfit and Ronny Robbins. In just six short years, Larry’s Country Diner has become one of classic country music enthusiasts’ most-adored programs. One of the top-rated shows on the RFD-TV network, the homespun variety show delivers a family-sized helping of country music performances by the stars of yesterday and today, with a side of hearty laughter and good ole southern charm. Set in a small-town diner with just eighteen tables that host the LIVE studio audience, the show’s spontaneity and impromptu nature only add to its unique appeal, pulling an estimated audience 1.4 million people each and every month to the network. During the cruise, fans will get to be a part of the “Larry’s Country Diner” studio audience, get up close and personal with their favorite diner cast members and enjoy stellar performance by iconic country artists. On dry land, fans would have to wait over a year to get a seat at the diner given the current waiting list! Tickets for the seven-day cruise start at $1,195 per person and are on sale now, but they're going fast. TO BOOK YOUR TRIP, please visitwww.cfrcruise.com. There are a variety of room sizes and accommodations to choose from. For more information, call 1-800-820-5405 or emailinfo@cfrcruise.com. To learn more about the available accommodations and FAQs visit:www.cfrcruise.com/prices.